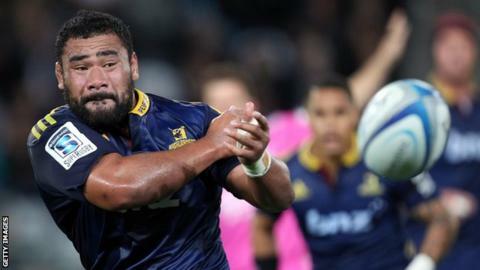 Ospreys have signed prop Ma'afu Fia on a three-year contract from Super Rugby side Highlanders. The 25-year-old is currently recovering from a knee ligament injury sustained in March that ruled him out of the Super 15 season. "We've monitored his recovery and are happy that he will make a big impact in an Ospreys jersey," said Ospreys general manager Andrew Millward. Tongan-born Fia made 39 appearances for New Zealand side Highlanders. He has also played 61 times for Manawatu in the ITM Cup, New Zealand's principle domestic competition, helping them to Championship success in 2014, and was part of the New Zealand side that won the 2009 Junior World Championship. Fia will arrive in Wales later in October to continue his rehabilitation from injury, but Ospreys have not said when the tight-head is expected to be fit to play. "The signing of Ma'afu is a significant one for us," added Millward. "He's someone we targeted quite some time ago, and we would have hoped to confirm this signing much earlier in the year, only for him to pick up a ligament injury early into the Super Rugby season." Fia's imminent arrival means prop Oliver Tomaszczyk, who joined Ospreys on a short-term deal in September, has left the Welsh region.